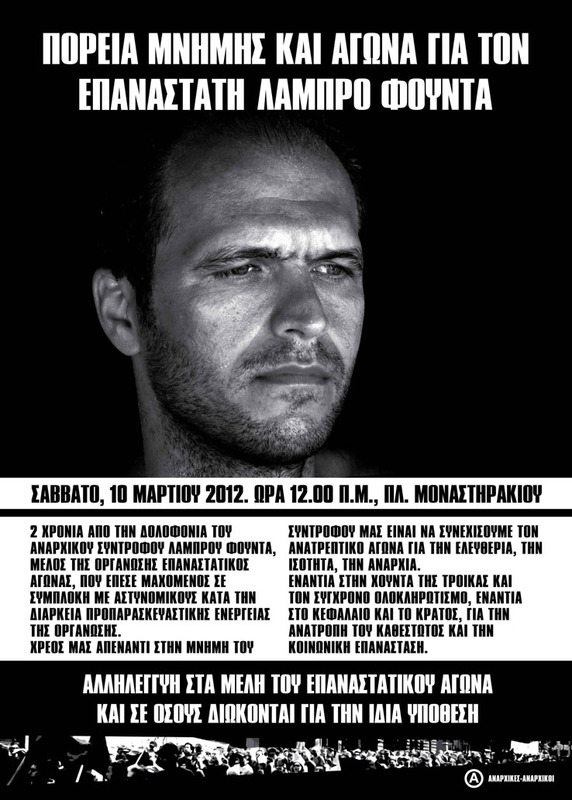 Two years after his fall in battle, Lambros Foundas remains unforgotten! Tomorrow, a demonstration will be held, as a sign of rememberance but also of continuation of the struggle. Our thoughts are with him, with the approximately 40 anarchist prisoners in Greek prisons, and with all those on the frontlines of the war against capital and state. AGAINST THE JUNTA OF THE TROIKA AND THE MODERN TOTALITARIANISM, AGAINST STATE AND CAPITAL, FOR THE SUBVERSION OF THE REGIME AND THE SOCIAL REVOLUTION. SOLIDARITY TO THE MEMBERS OF THE REVOLUTIONARY STRUGGLE AND TO THOSE WHO ARE BEING PROSECUTED FOR THE SAME CASE. You can read more about Lambros Foundas by clicking here. Du browst gerade in den Fire and Flames Weblog-Archiven nach dem Tag 'lambros-foundas'.